This may seem like a silly post, but as much as I absolutely love big baggy jumpers and hoodies I normally shy away from them when out in public. Everyone has their own body image issues, and essentially I’ve never really allowed myself to wear something ‘unflattering’. Funny when this is my perfect lounge wear to hide away in when I’m chilling in the comfort of my own home. But yeah, frilly jumpers and patterned pants aren’t typically my go to. Something I always admire on others, but again, something I would never think to wear myself because I never thought I’d suit them or because I thought they’d emphasise certain places I was unhappy with or whatever. Exactly, whatever. I’m past caring and I’m actually really enjoying fashion again. 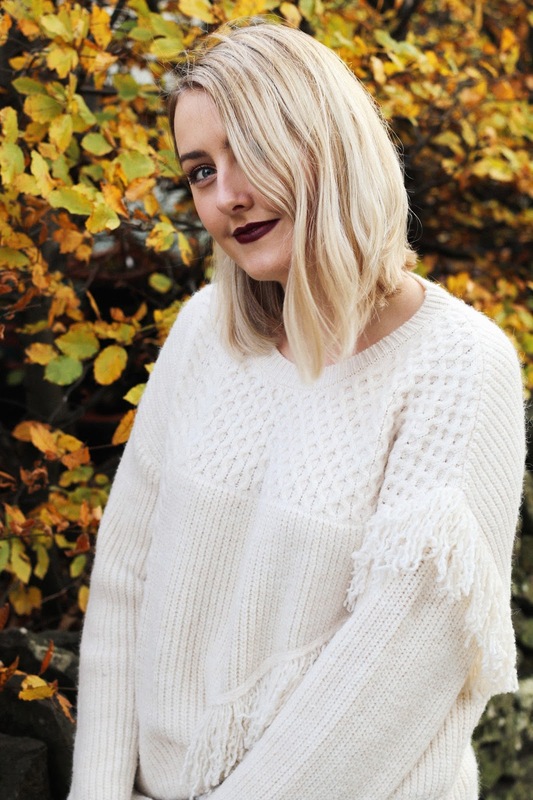 I even bought pink tartan-esque trousers the other month, a ever-so-slightly cropped t-shirt with awkwardly long sleeves and here I am posting photo’s of myself in a (not-so) frilly oversized jumper. It’s a funny thing too because I actually love these photo’s and I wouldn’t even say this outfit was particularly unflattering. I felt great and super comfortable. It’s just one of those silly things our brains do. I guess you could basically say I’m no longer fretting over weight gain and I’m finally embracing baggy A/W knits. What are your favourite and most comfortable A/W pieces? 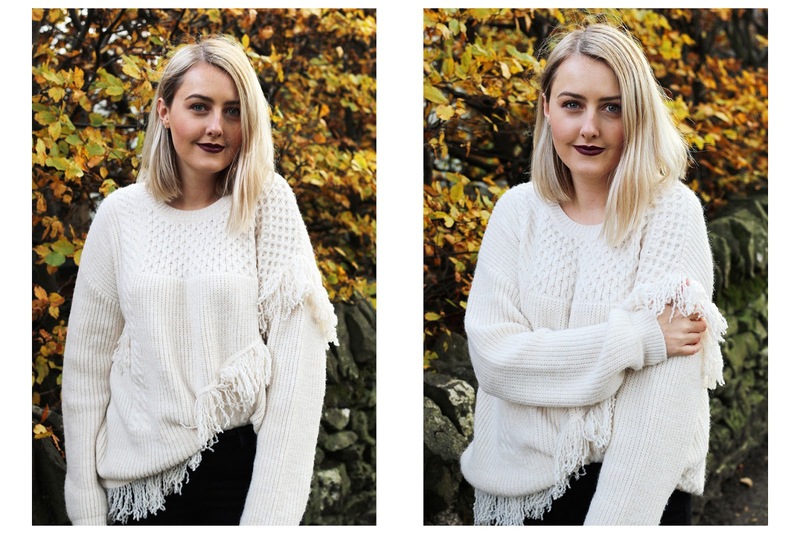 There is nothing like a good winter knit, I am loving your white jumper that is so different! I used to feel the same but now I'm obsessed with flare trousers! They're just so much comfier.. Thanks lovely. So cosy, right?! That's such a lovely jumper, but with my active lifestyle I'd be forever catching the dangly bits on things, lol! It looks so cosy though! I am all about the baggy knits at this time of year! The baggier the better, they are so lovely to wrap up in! I love big baggy knits because they make me feel so cosy! I love baggy knits at this time of year, they're the perfect way to feel cosy - you look gorgeous. I love a baggy knit in autumn winter - I basically live in them - inside and outside the house! I love this jumper, I think it looks great on you! 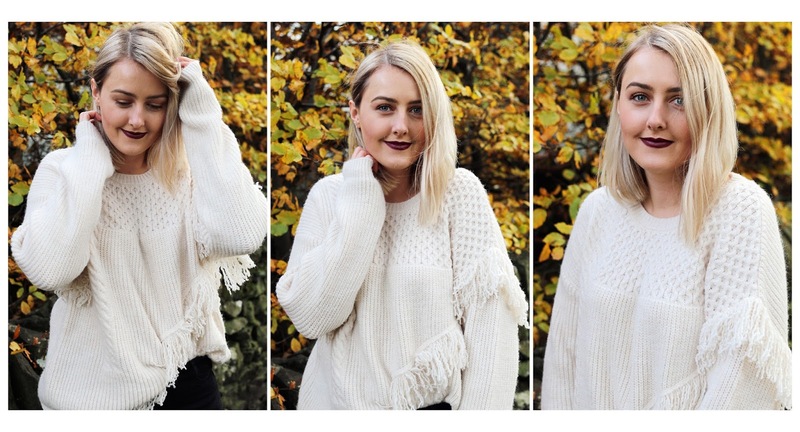 I personally love a big chunky knit in winter, they are so warm and cosy!